The 615C skidder and LS855C shovel logger work in tandem. 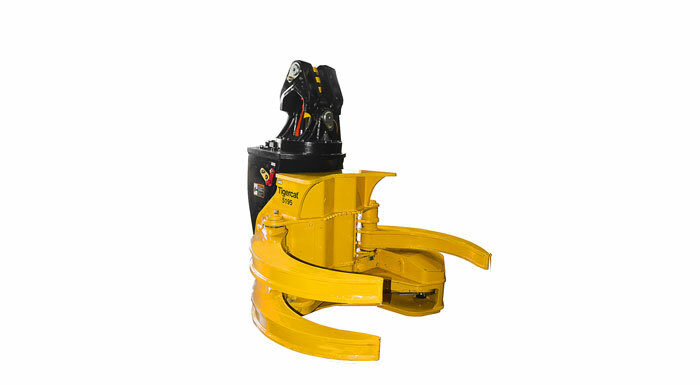 The shovel logger can move wood from the steepest sections of the tract and pre-bunch for the skidder, significantly improving skidder production on the steep tracts. (L-R) Claudio Albornoz (Latin Equipment Sales Specialist), Rossana Constant (Tigercat international sales administrator), José Hidalgo (owner, Mecharv) and Rodrigo De la Sotta (Latin Equipment Sales Specialist) in front of an antique steam engine, part of José’s vast equipment collection. José feels that this structure enhances employee performance because they have a real stake in the company. “If I have a proposal to invest very heavily, it becomes a board decision. Usually I make decisions because they trust me but I want the employees to know and feel that they participate in decision making. If I have their loyalty, I know that they will work hard for Mecharv.” To get started, José purchased a used Ponsse CTL system from his former employer. Unfortunately the machines were not in the best condition. “At the beginning, it was not easy,” José recalls. “We had a great deal of technical experience but not business or commercial experience. We were forced to learn in a hurry. We learned by falling and failing many times.” While the CTL system worked, harvesting around 15 000 m3 the first year, José dreamed of a day when he could operate equipment perfectly suited to the operations. He also envisioned owning a single brand to take advantage of economies of scale and to have the suitable mechanical knowledge to maintain and repair everything in-house. Manuel Chicioada is operations manager responsible for all of Mecharv’s diverse and varied eucalyptus harvesting configurations. Total monthly production is 140 000 m³, nearly ten times the volume of 2001 and the company now employs 190. The operator uses the Turnaround seat extensively in this challenging application. Monte Aguila was purchased by another forestry company, Forestal Mininco, in 2004. Mininco manages forests and exports cellulose and José is thankful that the company has evaluated and recognized the good work that Mecharv has performed. Mecharv currently operates two eucalyptus infield chipping systems for Mininco. One works full time and the second is used as a back-up in case one of Mininco’s other contractors fails to supply its contracted volume. “The back-up maintains and guarantees the chip supply for Mininco’s Santa Fé facility,” says José. The single chipping system produces 35 000 m³ per month with a 724E drive-to-tree feller buncher, two skidders—a 630D and a 620D—and a Precision Husky debarker/chipper. Mecharv’s two full-tree systems each produce 20 000 m3 per month. The configurations are identical with one 724E feller buncher, two 620D skidders and one T240 equipped with a ground saw slasher. Two machines, a truck-mounted 220C and T250, are used for loading. José explains that the 220C is employed in case they decide to leave a job with wood still at roadside. Later on the truck can drive back easily to the site to load the wood. These two operations supply Mininco’s Santa Fé cellulose mill. Wood is trucked full-tree, topped to 5 cm with branches and bark intact. The mill debranches and debarks at its own facilities, utilizing the material as biomass fuel for the mill. Another system provides a similar full-tree product to Forestal Celco SA, a subsidiary of the Arauco Group, except the system operates on steep slopes. It is comprised of an L830C feller buncher, one 604C cable skidder as well as 610C and 620D skidders equipped with winches. A Timberpro 630 with a grapple saw works at roadside. Chile is a mountainous country and there is no shortage of eucalyptus plantations on steep terrain. The steep hillsides often offer an excellent climate and ideal growing conditions. Generally the valleys and lower sections of the mountains are planted with eucalyptus and radiata pine. The higher elevations approaching the Andes range to the north are planted primarily with radiata. Mecharv has a couple of additional mechanized steep ground crews. One system consists of an old Valmet track buncher (soon to be replaced by a Tigercat L845C which Mecharv has already ordered), a Tigercat 604C cable skidder and a T234 slasher-equipped loader. The trees are bucked to 5–7 m lengths with bark and branches intact. According to José, the LS855C is very versatile. It fells, shovels and can crosscut at roadside and even load trucks if required. Few in Chile thought the concept would work and now many are taking notice. The newest steep terrain system—working on Mininco plantations—utilizes a Tigercat LS855C shovel logger equipped with a Satco processing head. It fells, shovels and pre-bunches for the skidders. A new 615C, the first in South America, and a 604C skid to roadside where the trees are bucked to length with no further processing. The shovel logger and six-wheel skidder work very well together, with the shovel greatly improving the productivity of the skidder by conveying the wood uphill from the steepest sections of the block. José, a pioneer in Chile with the LS855C, explains that the shovel logger is a very versatile machine because it can crosscut at roadside and can even load trucks if required. He adds that few in Chile thought the concept would work, yet he has created a very productive new operation based around the machine and now others are taking notice. The first Tigercat 615C in Chile uphill skidding on one of Mecharv’s mechanized steep slope systems. KBM owner Daniel Hermosilla talks to BTB about the equipment and human resources required to produce chips efficiently in Chile.